Here you will find access to Darwin’s private papers, notebooks, diaries and research notes. 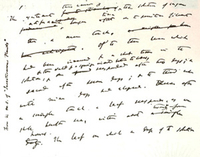 Darwin’s handwriting can be difficult to read but you will get used to it. Some of the manuscripts have been transcribed and are available in a searchable format.